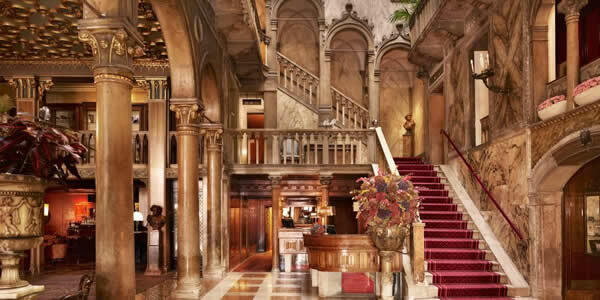 The lobby at the Hotel Danieli in Venice. In the 14th century, just a few doors down from the Palazzo Ducale (Doge's Palace) , Doge Dandolo built one of the prettiest palazzi overlooking the bacino San Marco. 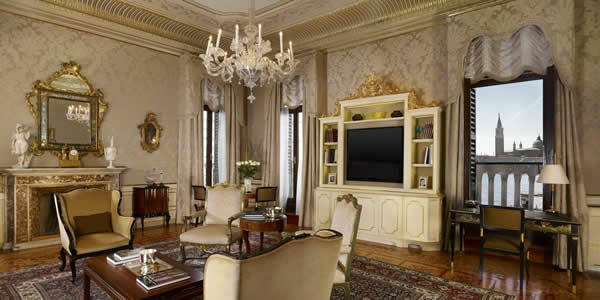 It has been serving elite visitors to Venice since 1822 in posh, Oriental-tinged splendor. The Danieli's best attribute—other than its prime location and those killer water views from rooms along the front—is its centerpiece: a four-story central atrium of Gothic arches and elegant balustrades, sky-lit and dripping with greenery and palm fronds. When it comes to choosing a room—all of them tastefully fitted with a restrained decor of antiques, Oriental rugs, and oil paintings—those in the original wing have more atmosphere and old fashioned style, but are smaller than accommodations in the 19th century wing next-door. Whatever you do, avoid getting stuck in the bland 1940s addition—you didn't come all this way to pay this much and not stay in historic opulence. A room at the Hotel Danieli in Venice. Castello 4196 - On Riva degli Schiavoni; just walk from San Marco toward the water, turn left to walk along the bacino San Marco, go over one footbridge, and you're there.